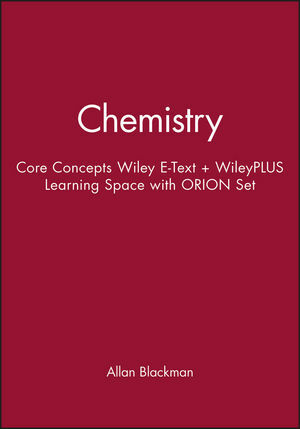 This first edition e-text of Chemistry Core Concepts is for university students with no or limited experience in the science. Students are introduced to the fundamentals of chemistry. The book, which was developed by leading chemistry educators, allows students to build their confidence and knowledge for greater success in their scientific studies. Examples and case studies are provided in the text to reinforce the core concepts. This textbook comes with the WileyPLUS Learning Space. The Learning Space contains course content organized within an online community. In the space, students have the opportunity to engage with key content, as well as their instructor and fellow students. Based on cognitive science, WileyPLUS with ORION, provides students with a personal, adaptive learning experience so they can build their proficiency on topics and use their study time most effectively.